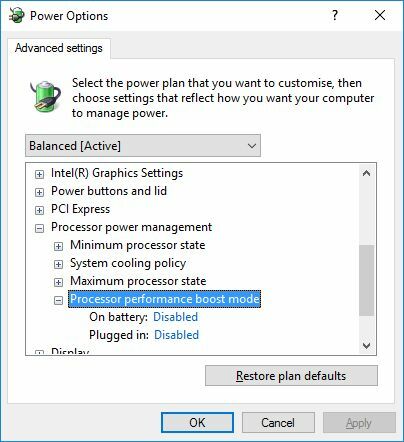 2.4 – Advanced Power Management Settings – The Return! After some searches, I found the culprit: Intel Turbo Boost Technology. Intel Turbo Boost Technology is a way to automatically run the processor core faster than the noted frequency. The processor must work in the power, temperature, and specification limits of the thermal design power (TDP). Single and multi-threaded application performance increase. The GL553VD is powered by an Intel Core i7 7700HQ. This quad-core processor works at 2.8GHz (the processor name in the registry is: Intel(R) Core(TM) i7-7700HQ CPU @ 2.80GHz). Thanks to Intel Turbo Boost, the CPU can work in an overclocked mode and the CPU clock can jump up to 3.8GHz. 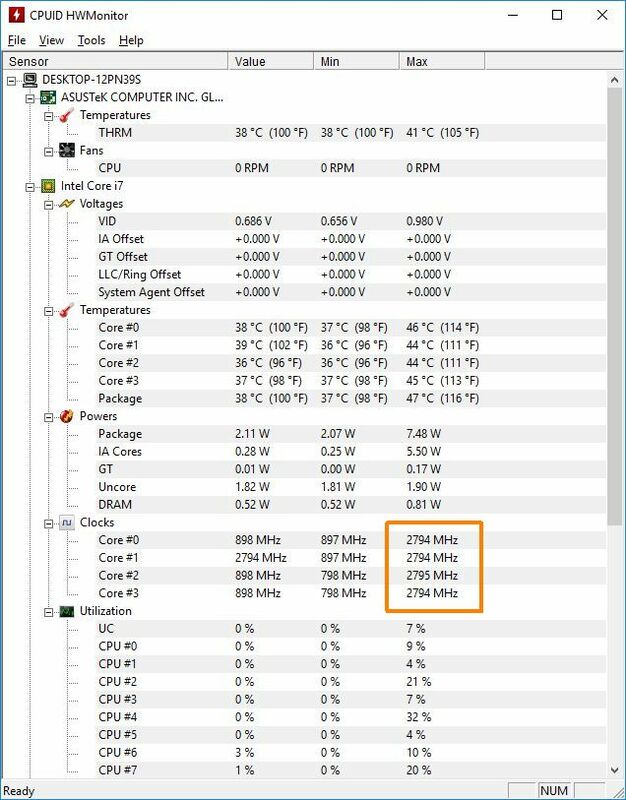 On a desktop machine with a decent CPU cooler, such increases of clock speed are more of less invisible in terms of noise, but on a laptop, you hear them. And it’s really annoying. I found and tested several techniques to disable Intel Turbo Boost Technology. This is the most simple technique. On desktop motherboards, there is such option in the BIOS. But unfortunately, this kind of option is not available in the GL553VD BIOS! The second technique I found is to set the maximum processor state to 99%. 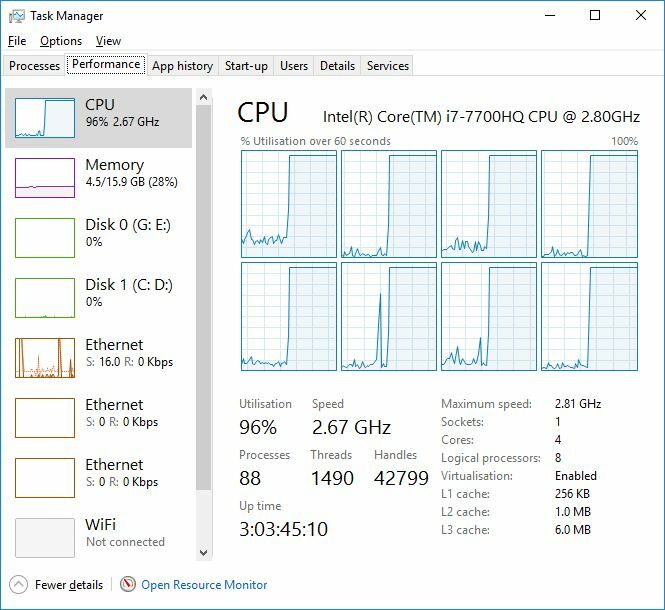 By default the max processor state is 100% and Intel Turbo Boost kicks off when the CPU reaches 100% usage. If we set the max processor state to 99%, the Turbo Boost technology is disabled. 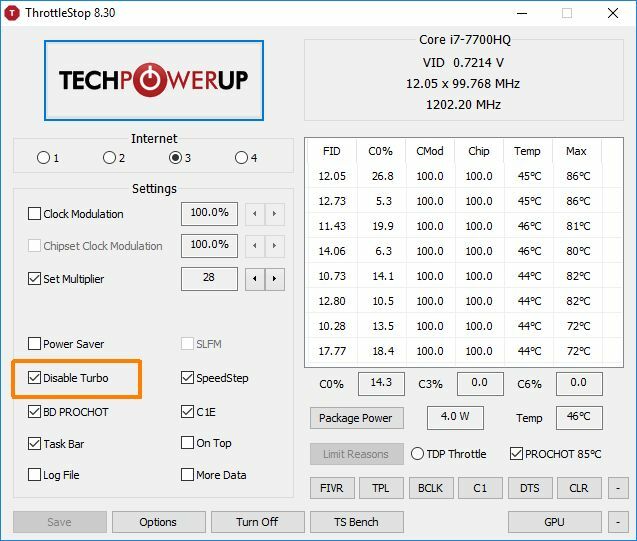 This technique limits the CPU clock speed to 2.8GHz, allows a 100% CPU usage and is saved in Windows registry so Intel Turbo Boost is still disabled after a reboot. Thanks to this technique, the cooling system is quiet. No more fan noise when I launch firefox! You can download this registry update from THIS PAGE. Unzip the archive, right-click on the reg file and merge. On a standard factory pre-installed system Turbo-Boost is disabled? How about launching a game? We have to manually enabling Turbo-Boost befor running a game? Problably. But I didn’t find any tool on ASUS website to tune the fan speed. I installed the ROG Gaming Center tool that includes a Fan Boost utility, but it seems to have no effect on the Turbo Boost. That’s why I tested alternative methods to reduce the noise. OK. I’m asking so much questions, because I consider buying that Asus. You mean that when I run a game the turbo boost will be enabled in game even though it’s disabled in Windows? Or you mean that turbo boost is no needed in games? Beacause I think it should be working in games and other heavy tasks. hello. I’ve bought this laptop yesterday and i have the same problem with fan noise. I followed your steps, but still fan noise is disturbing, only surfing internet explorer on chrome. Did you find a solution recently ? 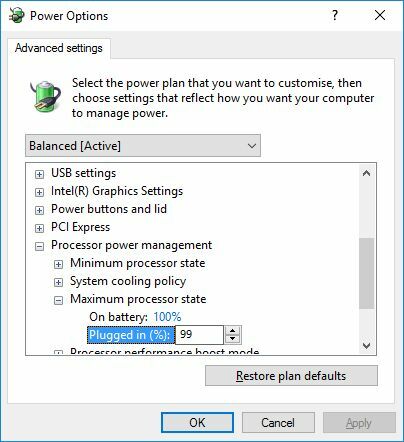 What are the drawbacks, if any, of method 2.4 “Advanced Power Management Settings”? Settings there allow to revert the change if needed? THANK YOU!! This Lenovo Yoga laptop is now good for casual web browsing! Why don’t they put that switch front and center so people that prefer silence + cool over loud fan + scalding heat can choose it? IMO the turbo should be off by default when on battery. It is safer by disabling via Bios but so many laptop have very less setting on there Bios like my old HP laptop but by using App is safer for because its 3rd party app ? Registry option is excellent, thanks! Mine was set to aggressive lol, disabled it right away. Is there anybody to explain each mode of method 2.4 (registry file) ? If I set up this registry, I can see 7 modes in Processor turbo mode. 3-7. I have no idea what they are different . hello, I’ve tried both the reg file and ThrottleStop software. None can disable Turboboost on my laptop. It’s an old model ASUS n53SV with i7 2630QM, running Windows 7 SP1 updated. I checked the reg file, just to see what it changes, if it’s safe or not. I can confirm it’s completely safe, and worked like a charm. 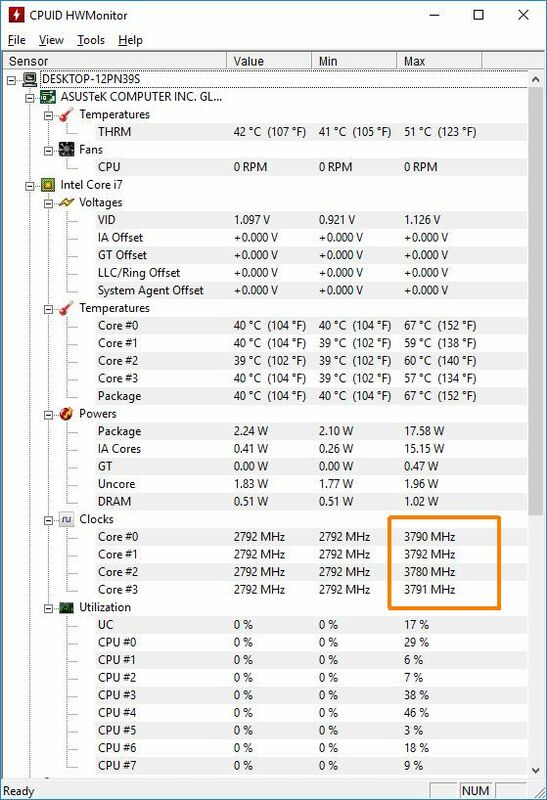 I regularly monitor my CPU temperature, because my laptop doesn’t really have a good cooling system (lazily placed one fan and 2 heatpipe), I used a premium cooling paste, plus a laptop cooler with a HUGE fan, but regardless these changes, my CPU kept hitting 80+°C while playing PUBG (87°C was the max). After using the registry file, and disabling Turbo Boost, the average temperature under heavy load went down to ca. 71-2°C with max temperature of 74°C while playing PUBG for almost 2 hours. The performance hit was totally minimal/ none at all. To sum it up, if you really want to use your precious device for a good while with minimal performance degradation over the years, I suggest you to turn Turbo Boost off, and if you want even lower temperature, undervolt your GPU. Thank you so much, I have ASUS B9440UA and Windows 10 and this was very helpfull. Firstly I set maximum processor state to 99% and processor went immediately from 3,5GHz to 2,79GHz and also temperature from 79 C to 59 C after short while and fan is finally quiet. Registry option is also working, thank you.